Hertha Berlin remain third in the Bundesliga standings despite being held to a goalless draw at home to mid-table FC Augsburg on Matchday 18. A match-up between two of the Bundesliga’s form sides duly served up an evenly contested first half with chances at both ends. 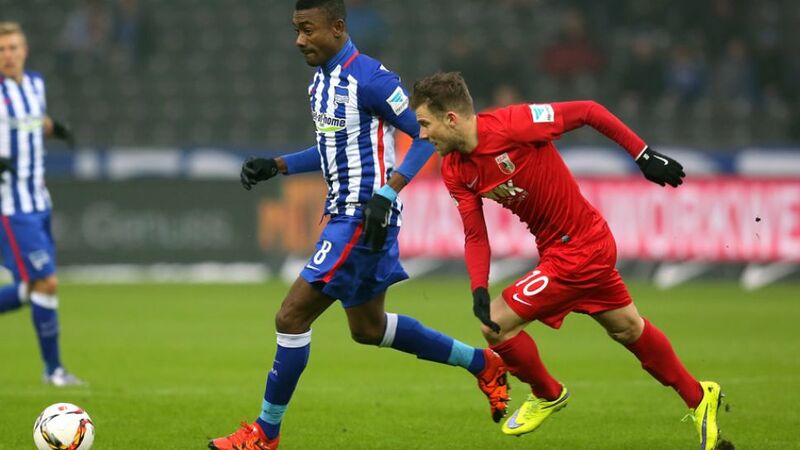 Hertha leading goalscorer Salomon Kalou was on the receiving end of one of the best of them, but the Cote d’Ivoire international was unable to beat Augsburg goalkeeper Marwin Hitz from 16 yards. Hitz was called on again to deny Vedad Ibisevic, before Caiuby’s downward header brought a routine save out of Hertha’s Rune Jarstein at the other end. Augsburg continued in much the same vein immediately after the restart, with Raul Bobadilla unlucky to see an effort bobble narrowly wide after a fantastic bit of skill on the edge of the Hertha box. Jarstein was beaten again moments later, but Daniel Baier’s deft diving header sailed agonisingly past the left-hand post. Keeping a clean sheet became the priority for both sides as the clock ticked down, with neither goalkeeper having a save to make in the latter stages. Although Bobadilla spurned the best opportunity of the match, the burly Paraguay international underlined his all-round value to the Augsburg cause with a tireless display. Of the handful of chances, not one fell into the ‘clear-cut’ category, which suggests Hertha and Augsburg are going to be very difficult to beat in 2016. Hertha are unbeaten in their last seven Bundesliga matches; Augsburg in their last six.Saturday’s game was the first goalless draw Hertha have been involved in all season.